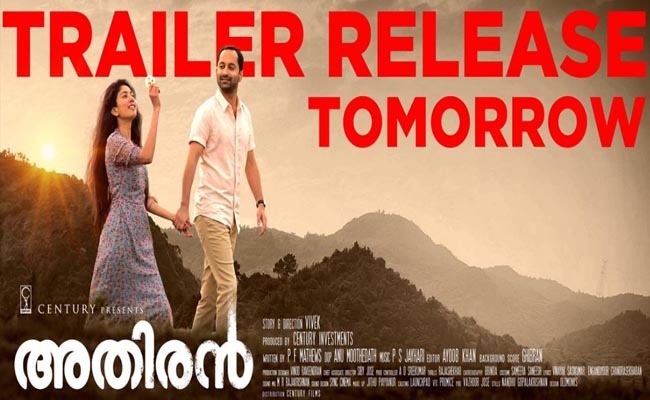 The trailer of the much awaited Fahadh Faasil starrer Athiran is going to be released tomorrow. As was tweeted by Sai Pallavi, the trailer is going to hit the media at 4 pm. Soon when the announcement was made the lead heroine of the project, social media has jumped into share their excitement. When the teaser got released last week, everyone has found the video footage stunning. This Vivek directorial marks the debut of Ghibran in Malayalam film industry. Incidentally, the BGM, which was featured in the teaser, has managed to garner quite a lot of applauses for the project. A ‘Century Investments’ production venture, Athiran is gearing up for a release by the second week of this month.